“I am a Writer.” Cristina Limpiada, author of Science Times article “Weird Looking Romanian Skeleton Unearthed in Transylvania Suspected as the ‘Vampire’ Myth” (February 18, 2017). Picture: Cristina Limpiada/Twitter. Cristina Limpiada wrote an article for Science Times covering a vampire burial recently unearthed in Romania. Strangely, neither of the sources Limpiada cited in her article mention anything about vampires. So, I decided to investigate her claim. It’s easy to assume Limpiada sensationalised the excavation, adding the vampire angle as cheap clickbait. Too easy. But I wanted to give Limpiada the benefit of the doubt; I wanted her to properly explain the vampire angle she used and why. So, I sought Limpiada out for further clarification. And believe you me, it wasn’t easy. I have a few questions for her about it. A few minutes later, the email bounced back. I tried their “Editorial Department” email, with the same message. That bounced back, too. If so, I would like to ask you a few questions about it, if that’s ok. Yes. I wrote that article. Yeah sure. Excellent. Thank you, Cristina. I just need a little time to formulate them. I take it you’ll allow me to post your answers on my site, Vamped. I would like a photo of you to go with it, if possible. The photo must be in landscape format and no smaller than 950px. You could do a photo on your smartphone or a digital camera if you like. That would guarantee a photo with that minimum size requirement. Just make sure it’s in landscape format. Thanks again, Cristina. Looking forward to your answers! Hi Cristina. Can you tell me a bit about your writing background? How did you get into it? 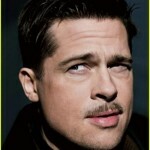 I notice from your resume that you are currently employed as a Website Content Writer, writing content for the Electric Scooter website and product reviews for Amazon. Can you tell me a bit more about what’s expected from you in these roles? Are you one of those people who get paid to write fake reviews that I’ve read about? Let’s focus a bit more on your article. How did you come across the story? It hasn’t been given too much media coverage. Why did you decide to write about it? Did you read about the dig in any other sources apart from the two you cited, Phys.org and CityNews.com.au? Did you contact anyone associated with the dig? Were you aware that it had actually been arranged by ArchaeoTek? You didn’t mention them in your article. Unfortunately, I also noticed a few mistakes in your article. I wrote about them, too. For instance, you referred to moving graves, when your sources were actually referring to the migrations of Szekely people to the area. You also said Coco James lead the team (she didn’t). Are you surprised the site’s editors didn’t pick up on errors like that? The biggest sticking point, to me, was the vampire angle. Despite acknowledging Coco James’ theory that the body had been accidentally dropped into the grave, you added: “While the confusing grave number 42 is still questionable for the common people thought it will give a clue to the vampire myth in Romania.” Neither James, nor your sources said anything about vampires. In fact, ArchaeoTek’s director, Andre Gonciar, said: “The Science Times presentation has added the fantasy factor in order to boost ratings – no vampires were directly involved.” Is this correct? Did you make it up or do you have an undisclosed source for your claim? Cristina, were you reporting on the dig or sensationalising it? If so, why? You’ve written lots of articles for Science Times. Can you walk me through the process involved in getting articles published on their website? I’ve had a look through your resume and don’t see any science background mentioned. What qualifications did Science Times require when they agreed to publish your articles? As a professional writer, you’ve probably come across a lot of commentary about our “post truth” era, “alternative facts” and “fake news” in the media. How important is truth in journalism to you? I eagerly awaited Cristina’s reply, checking my phone over and over again just in case I missed it. Sorry but I found some of your questions very offensive. I would not want to make any other comments regarding my job. If you believe that I write fake news, then its up to you. All I can say is that I am not one of those. Good luck. Our staff does not only excel in journalism but also in content creation, commentary, and reviews to give our audience the best resources to supply and satisfy the reader’s pursuit for knowledge in this area. I’m confused. Which questions did you find offensive? On March 1, 2017, I tried contacting your “Questions or Comments” and “Editorial Department” email addresses, but both emails bounced back. I am trying this one as a last resort. 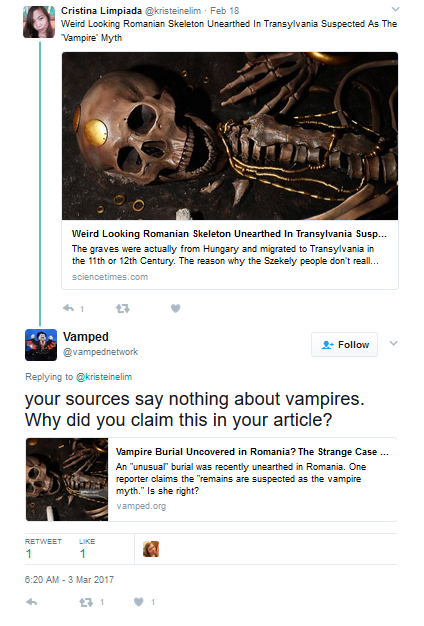 I have some questions about a recent article you published on your website, “Weird Looking Romanian Skeleton Unearthed in Transylvania Suspected as the ‘Vampire’ Myth” by Cristina Limpiada (February 18, 2017). Neither of the sources Limpiada cited in her article mention vampires. She provided no source for her vampire commentary and has refused to answer my query about this vampire angle. Can you confirm a source for her vampire claim? If so, what was it? Considering the article’s other anomalies — including references to moving graves, when her sources actually refer to human migration in the region — and the article’s generally poor grammar, was much time spent editing the article? Was Limpiada paid for it? If so, how much? Limpiada’s online resume, found on Hubstaff Talent, mentions no scientific background, yet you’ve accepted and published many of her articles. What qualifications do you seek when accepting submissions for your website? That email bounced back, too. The lesson from this sordid tale is this: you can only go so far with your research. Sometimes, people won’t play ball, no matter how hard you try—no matter how many chances you give. With that in mind, what other conclusion can I reach other than Limpiada spicing up a news story about a deviant burial with vampires in order to attract hits? It certainly worked with me—but probably not in the way she was expecting. I am friendly, honest, keen to details, versatile, fast learner, high-oriented and quality focused writer and virtual assistant with more than 5 years of experience in hands-on administrative and academic tasks. I can help you transform your data into meaningful and fruitful information. She also has a demonstated aptitude for manufacturing sensationalist content and evading questions about her work. It’s also concerning that a site of Science Times‘ calibre—at least, the calibre it aspires to be—had such a demonstrably poor editorial process for Limpiada’s article, especially when verifying the story only required taking a quick peek at Limpiada’s sources. That puts a dent in its “credible news” claim. Beyond the dodgy journalism exhibited by Limpiada and Science Times for this story, the article is symptomatic of many media outlets jazzing up archaeological digs with pop culture overlays. Limpiada isn’t the first person to turn deviant burials into vampire burials and she won’t be the last. Shortly before resuming work on this article, I received an email notification for a blog post about a “Plague of English Vampires” recently found in Wharram Percy, Yorkshire. “Oh no, not again,” I thought. The actual articles cited in the blog post about the Wharram Percy dig—from The Independent, Daily Mail and The Guardian, respectively—don’t use “vampire” in the way the blog post does. So rest assured, Cristina: you’re not alone! an article for Science Times covering a vampire burial: Cristina Limpiada, “Weird Looking Romanian Skeleton Unearthed in Transylvania Suspected as the ‘Vampire’ Myth,” The Science Times, February 18, 2017, accessed February 23, 2017, http://www.sciencetimes.com/articles/8957/20170218/weird-looking-romanian-skeleton-unearthed-in-transylvania-suspected-as-the-vampire-myth.htm. archive.is link: http://archive.is/2Zfpt. You might recall my findings: Anthony Hogg, “Vampire Burial Uncovered in Romania? The Strange Case of Grave 42,” Vamped, March 2, 2017, accessed March 6, 2017, http://vamped.org/2017/03/02/vampire-burial-uncovered-in-romania-the-strange-case-of-grave-42/. “The Science Times presentation”: Andre Gonciar, email message to the author, February 24, 2017. I tried their “Editorial Department” email, with the same message: Anthony Hogg, email message to editor@sciencetimes.com, March 1, 2017. I thought might be her profile on Hubstaff: “Cristina Limpiada,” Hubstaff Talent, n.d., accessed March 1, 2017, https://talent.hubstaff.com/profiles/cristina-limpiada. archive.is link: http://archive.is/Dxbgj. “Do you write articles for Science Times”: Anthony Hogg, email message to Cristina Limpiada, March 1, 2017. “Yes. I wrote that article”: Cristina Limpiada, email message to the author, March 1, 2017. “Excellent. Thank you, Cristina”: Anthony Hogg, email message to Cristina Limpiada, March 1, 2017. “Okay, no problem”: Cristina Limpiada, email message to the author, March 1, 2017. “Thank you for your co-operation”: Anthony Hogg, email message to Cristina Limpiada, March 2, 2017. “Sorry but I found some of your questions very offensive”: Cristina Limpiada, email message to the author, March 2, 2017. “provide[s] credible news & info.”: “About Us,” Science Times, n.d. accessed April 6, 2017, http://www.sciencetimes.com/about-us. archive.is link: https://archive.is/WbAqh. “Our staff does not only excel in journalism”: Ibid. “I’m confused”: Anthony Hogg, email message to Cristina Limpiada, March 2, 2017. “your sources say nothing about vampires”: Anthony Hogg (@vampednetwork), Twitter post, March 3, 2017, 6:20 a.m., https://twitter.com/vampednetwork/status/837668974615642112. “On March 1, 2017, I tried contacting your ‘Questions or Comments’ and ‘Editorial Department’ email addresses”: Anthony Hogg, email message to business@sciencetimes.com, March 1, 2017.
who also goes by Kristeine Lim or Cristina L.: cristinalimpiada (Cristina Limpiada), “Ma. Cristina Limpiada (Kristeine Lim),” Kristeine Lim: Your Virtual Assistant Partner, April 13, 2015, accessed April 6, 2017, https://kristeinelim.wordpress.com/2015/04/13/kristeine-lim/, archive.is link: https://archive.is/UPvfw; “Cristina L.,” Upwork, 2015–2017, accessed April 6, 2017, https://www.upwork.com/o/profiles/users/_~01dc2eb93b7811ef50/. archive.is link: https://archive.is/Fj3SK. “I am friendly, honest, keen to details”: Cristina Limpiada, LinkedIn account, accessed April 6, 2017, https://ph.linkedin.com/in/cristina-limpiada. “Plague of English Vampires”: Lucy Northenra, “Is a Yorkshire Village Home to the First Plague of English Vampires?” Open Graves, Open Minds (blog), April 3, 2017, accessed April 3, 2017, http://www.opengravesopenminds.com/ma-reading-the-vampire-module-news/is-a-yorkshire-village-home-to-the-first-plague-of-english-vampires/. archive.is link: https://archive.is/ZMcfA. “New scientific research suggests”: David Keys, “Scientists Uncover Medieval Remains of the First English ‘Living Dead,'” Independent (London), April 3, 2017, accessed April 6, 2017, http://www.independent.co.uk/news/science/archaeology/archaeology-scientists-find-medieval-remains-english-vampires-yorkshire-wharram-percy-a7663121.html. archive.is link: https://archive.is/ayIPd. “ZOMBIES”: Colin Fernandez, “Archaeologists Discover Medieval Villagers in Yorkshire Hacked Up Dead Bodies to Prevent Them Returning as ZOMBIES,” Daily Mail (London), April 3, 2017, accessed April 6, 2017, http://www.dailymail.co.uk/news/article-4373608/Medieval-villagers-dismembered-corpses-prevent-Zombies.html. archive.is link: https://archive.is/mBGCs. “restless dead”: Maev Kennedy, “Medieval Villagers Mutilated the Dead to Stop Them Rising, Study Finds,” Guardian (Manchester), April 3, 2017, accessed April 6, 2017, https://www.theguardian.com/science/2017/apr/03/medieval-villagers-mutilated-the-dead-to-stop-them-rising-study-finds?CMP=share_btn_tw. archive.is link: https://archive.is/n5yu8. the findings were published in the Journal of Archaeological Science: Reports: S. Mays, R. Fryer, A.W.G. Pike, M.J. Cooper, and P. Marshall, “A Multidisciplinary Study of a Burnt and Mutilated Assemblage of Human Remains from a Deserted Mediaeval Village in England,” Journal of Archaeological Science: Reports (2017). http://dx.doi.org/10.1016/j.jasrep.2017.02.023. “Questions for Cristina Limpiada“: Pdf rendering of the Microsoft Word document I sent to Cristina Limpiada on March 2, 2017.